It’s almost ice cream season. I can feel it. Last weekend, one of the local ice cream chains in Copenhagen celebrated the (early) start to the season with free scoops on Saturday afternoon. It is a bit too cold for me to warrant ice cream but it’s close. Speaking of ice cream, here is a modern ice cream and cheese retailer in Auckland, NZ that I found. Kapiti is a gourmet dairy producer in New Zealand, and last year, it launched an ice cream and cheese concept store under the funky boutique Hotel deBrett. I’ve visited my share of cheese and ice cream stores in and around Europe and none look like this. I particularly liked how Kapiti and its designers went for a modern grocery store look, with neutral colours, industrial subway tiles, exposed brick and concrete. This is more like an ice cream and cheese loft! This is in contrast to something literal, you know, with ice cream cones on the walls or sky high shelves of cheese. The barrels give it a cool wine bar vibe. I also thought it was clever how they used milk bottles as lights in the store. I’m in the trenches with my sleeves rolled up. I am referring to the volume of work related tasks I am attempting to plow through between now and the time I board a plane for Toronto. With several projects on the go, my eyes will soon be in need of a rest! Today I did something out of the ordinary while eating breakfast: Turn the TV on. I don’t often flick on the television while eating my morning granola and yogurt but for some reason, I did. One of those “discover” travel programs were on about New Zealand and the extreme sports and golf opportunities available around the country. Golf, I would entertain. I am not sure how I feel about extreme sports. After thinking about how I could one day get to New Zealand to experience the beauty of its landscapes, my mind wandered to one of my few New Zealand associations: Coffee. (The other association is wine). Don’t ask me why I know about New Zealand’s reputation for coffee but I know it exists. Apparently coffee is taken very seriously in that country. Ironically, being a non-coffee drinker, my only direct experience with any sort of New Zealand coffee is from visiting a kiwi run coffee shop in Toronto’s Leslieville area. Te-Aro has good tea and vegan carrot muffins. On the topic of New Zealand coffee culture, I started poking around to see who the players were, why NZ coffee has such a stellar reputation and why its reputation has crossed international waters. While I am still searching for the answers to my questions, Coffee Supreme crossed my path. 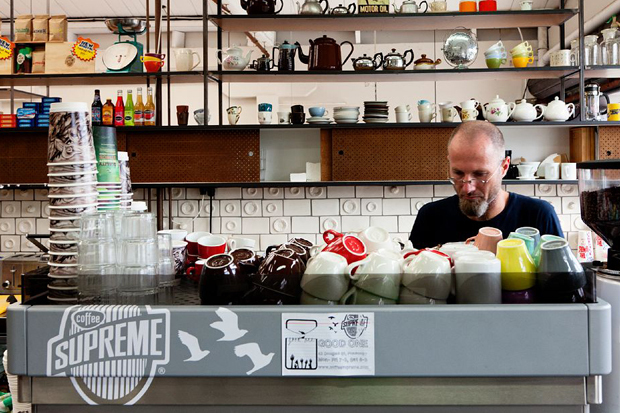 Coffee Supreme is an independent coffee roaster/sourcer & brewer with cafe locations in Auckland, Christchurch, Wellington and Melbourne (AUS). They also have a great online shop if you are looking to build out your in-home coffee routine with top of the line gadgets, accessories and beans. Just looking at their branding (from Hard Hat Design) and crazy, eclectic interiors (industrial-lab-vintage-retro-market-chic), it is easy to see why they have such a loyal following of coffee drinkers. So cool. These cool coffee bags (in the image below) were designed by Work Art Life in Melborne. 16 different takeaway cups were illustrated by the Hard Hat design team in paint, ink, chalk and pencil. The three different colour cups reflect the three different sizes of coffee available, making it easier on the baristas when line ups get busy. Has anyone been to Coffee Supreme? Feel free to share your experiences in the comment section below. I was looking around my kitchen this past weekend after accidentally breaking yet another one of the delicate Riedel O glasses, thinking it may be time for a spring re-fresh; a few new accessories and gadgets to freshen-up the kitchen environment for spring. You know, the typical spring cleaning you do on your wardrobe where you edit items in and out? Same idea, but for the kitchen. I would like to add a couple new tools and delete some others that are on the brink of no-return- frayed plastic edges, chipped or broken ceramic and glass. Kitchen editing for spring, makes cooking more enjoyable when you have a new tool to play with. Not that cooking and entertaining isn’t fun, in and of itself! It’s just that, sometimes when you have something new and fun to use, culinary pride and excitement, that can diminish due to the monotonous rhythms of life, gets renewed. One of the concepts I noticed that appears to be making a comeback online is the “general store” e-commerce site where you can shop across several product categories, of niche brands for the home and the site gives you the feel of being in a general store. One store in particular, whose items I loooooove is Father Rabbit out of New Zealand. Father Rabbit has a wide variety of great, classic pieces for the home that have a bit of a vintage flare but could easily mix and match among contemporary accessories. I think my favourite kitchen items are the five photos I have selected below. Outside of a good spring cleaning, something that seriously needs to happen in my house, here are some other things I found this weekend that I thought you might enjoy. 1. Mim Design’s (Australia) interior of Joy Cupcakes. The quilt patch colourful wall, mixed with hanging wooden spoons on the wall, upside-down cupcake wrapper lights and a marble counter top (looks like marble) with a fringe that mirrors a doily is just spectacular. The store has lots of natural light but clearly screams, modern cupcake. 2. Design Attractor’s (Czech Republic) colourful Restyle Prints sold through Etsy.com. I, of course like this Retro Tea Prints, particularly the ones seen here, and here. 3. Seventeendoors’ post (Sweden) for the most stunning black and white kitchen I have seen in a while. It’s got floor to ceiling tiles, great eclectic hanging lamps, a chalkboard cupboard and a mix and match of stainless steel, black and white.